In my interview with Harry Mack, he gave us a lot of great tips for building a career as a freelance designer. I originally contacted Harry because of the article he wrote for Gamasutra called Best Tips for Building a Freelance Career. I’d like to combine the valuable advice from those sources and apply it to a career in pro audio as a sound engineer or designer. Use correct grammar and spelling in emails, with no shorthand. Speak clearly, confidently, and to the point. Be friendly and courteous. Respond promptly to emails. Be available. This is straightforward stuff, but being consistently professional will set you head and shoulders above the rest of the competition. This sounds easy, but is so hard. Sure, the first few months that you live in a new city you are checking your email every few minutes and bend over backwards to serve every potential client. But over time you become more and more busy, and it becomes harder to answer every email on time, friendly, and courteously. But damn, it’s so important! I know firsthand because I love it when people email me back promptly. That feels like a real relationship. When people email me back a month later without answering my questions, it feels like no relationship. I don’t have such a hard time calling people back, but it’s difficult for me to make email a priority. Since I’ve just identified email as the biggest hassle in my professional life, let’s solve it! Where to start? (Please say productivity tools please say productivity tools please say productivity tools.) No! No more games! Let’s get down to business. Organize your inbox: I must go through messages in a chronological order; there is just no other acceptable way for my mind to work. That’s fine, but it means I won’t respond to every message. Response Time < 30sec: Respond, move to SAVE folder. Response Time > 30sec: File under ACTION. Response Time > 30sec + Urgent: Flag Red, move to ACTION. Response Time > 10min: Just pick up the damn phone. If I reach the time limit and haven’t responded to all red flags, schedule a follow-up time, rinse and repeat. When Inbox is empty, move to ACTION folder and follow the same steps. Okay, let’s try this out. If I force myself to go through my inbox and not follow any links out, I file all of today’s email in ten minutes, complete flagged items in fifteen minutes, and have five minutes left to look at one ACTION item. Once I have momentum, it’s easy to prioritize and stay focused. I know the ACTION folder will build up, so I’ll have to schedule extra time to look at that once a week. In my particular case I have thousands of inbox emails going back five years. The only solution I’ve heard for this problem is called email amnesty and it works like this: 1) Select all; 2) Delete. Then email all of your contacts and let them know that if they sent you anything important in the last five years, please send it again. If you sent me that, I would be a little annoyed, but totally sympathetic. After going through your inbox a few times for organization, you will start to notice email newsletters and other regular mailings that you never read. Unsubscribe or add filters so that they automatically get filed away and don’t waste your time. As an aside, I would love an app that reads my email to me and then takes dictation. If anyone knows of something like that, or wants to build it with me, comment below! I’ve found the most successful tactic is to present a bid with a best-case and worst-case scenario. They’ll likely have a number in their head before contacting you, so if you overbid you’ll lose before even starting, and if you underbid, and underbid consistently, well, that’s a hard life to lead. My father once told me, “You don’t want to be known as the cheap guy who does great work.” One of the best things that I’ve learned from reading Ramit Sethi, talking to Harry Mack, and going to the dentist, is to never compete on price. When the customer asks about price, steer them back to focus on the content of the project. Talking about money too early on does a disservice to you and the client for two reasons: 1) You can’t give a meaningful quote without the right information, and 2) You want to be remembered for quality work, not low price, so even if they don’t end up working with you they should remember your personality and insightful conversation. Another advantage of using the best-case/worst-case bid is demonstrating to the client that I am aware of their budget concerns. Make sure you research the client when quoting, though, because a bare-bones estimate for an international law firm is a lot different than one for a local college. Working freelance has its ups and downs. Sometimes I’ll be up to my ears fighting off multiple projects at once, and it can be tricky making sure I get everything organized. Planning is important here, because the goal is to make sure every client gets the correct audio before milestones, without forgetting anything. For my sound engineering work, this is a little more simple to manage. I just make sure that I have my calendars synced between web, computer, and phone, and immediately add information I receive about the event load-in, start/end time, contacts, special requirements, and other details. For my sound design work I put milestones into the calendar to make sure I am on schedule to have all assets ready on time. Also, I use the Notes app in OSX and iOS to keep information synced across devices. 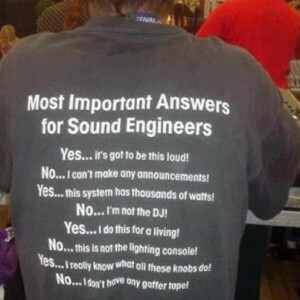 Like other sound engineers, I work with several clients regularly who need to know my availability. One technique that I’ve employed that I know some of you out there also use is to publish my work calendar publicly on my website. That way, when a client has an event they want me to work, they can quickly see whether or not I’m available. I’ve been told that one of my best traits as an audio designer is that I take criticism in a friendly and professional manner. It took a while to get there, as I’ve always been defensive of things I put time and thought into. Who isn’t? “The customer is always right” is a phrase everyone knows for a reason: it’s true. They are funding and making the game, and likely have a vision for the end product, including how it’s going to sound. OMG OMG OMG. This is so hard. Easy to talk about, difficult to practice. Just like Harry, I’ve had people tell me that they really like working with me because I’m easygoing and have a very can-do attitude. The reason I started working with the best band in Portugal is that I was the first one to ever let them try group distance miking. But the truth is that the ego is easily offended and can cause painful emotional surprises. A common example is corporate event producers who don’t want to see microphones or speakers, so they ask for lapel mics. The first thing I do is set up a quick demo so that they can hear sound quality and perceived loudness compared to a wireless handheld microphone. Then we usually have a quick conversation about acoustics and physics, yay! Another good communication technique is to tell the people that you are working with how much time their requests will take. “Yes, we can use a different projector, but it will take forty-five minutes to set up and doors open in fifteen minutes.” You avoid them running up to you in a panic later asking why things aren’t ready yet. Other times event producers will want a change, but think it’s impossible. “Oh don’t worry about it, it will take too long,” they might say. Then I have the opportunity to correct them and make everyone happy. Win-win! Be Professional: Stay on top of communications. Develop an email strategy. People will contact you more when you reply quickly and politely. Don’t Compete On Price: Provide realistic worst-case and best-case bids to meet the goals of the client. Stay Organized: Commit all project information to a calendar synchronized across all of your devices. Communicate Well: Check in with the client regularly to make sure the piano is on the right side of the stage.